Roll-under vanity with tilting mirrors paired with standard vanity for non-wheelchair user. Provides added storage with soft-close drawers and cabinet doors. 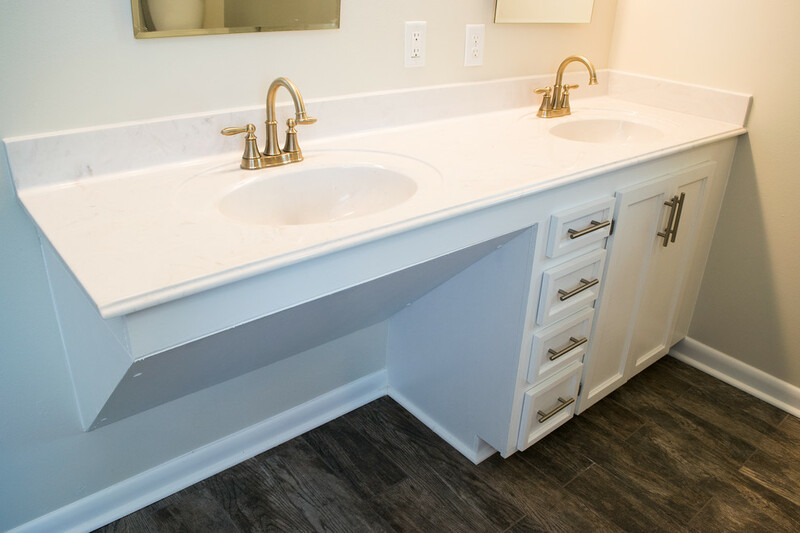 Cultured marble countertop with integrated shallow sinks by Daze Marble, Pineville, LA. 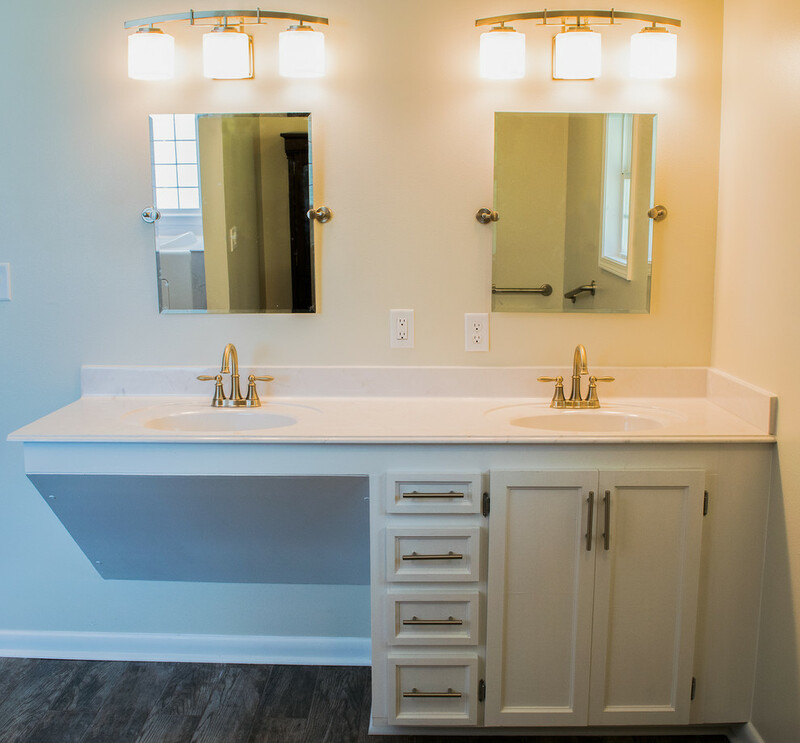 GFI outlets, sconce lighting, lever-handled fixtures. Textured ceramic tile flooring for anti-slip in a wet environment. 5' x 6' cultured marble shower built by Daze Marble, Pineville, LA. 18" job built bench with shower controls at wheelchair height. Grab bars placed strategically where requested by Veteran. Shower edge is a flexible rubber waterstopper barrier by Best Bath. Walk-in jetted bathtub with grab bars as needed by disabled veteran. Cultured marble surround and glass block window, with textured ceramic tile floor for high coefficient of friction to reduce slipping. Overhead LED lighting with controls at wheelchair height. Large addition fully equipped as a wheelchair accessible bathroom. Roll-under vanity combined with standard vanity, ADA comfort height toilet, walk-in jetted bathtub, barrier free cultured marble shower, textured ceramic tile flooring, grab bars wherever needed. Large addition (20' x 22') to existing home for accessible bathroom and extension of bedroom. Concrete patio extended toward backyard. Custom closet created from previous bathroom. Low shelves for wheelchair access, low clothes rod. Higher storage options for non-wheelchair users. Non-slip ceramic tile floor. LED lighting. ADA comfort height toilet. Grab bars for support in a remodeled bathroom designed for accessibility. Textured ceramic tile floor with high coefficient of friction. 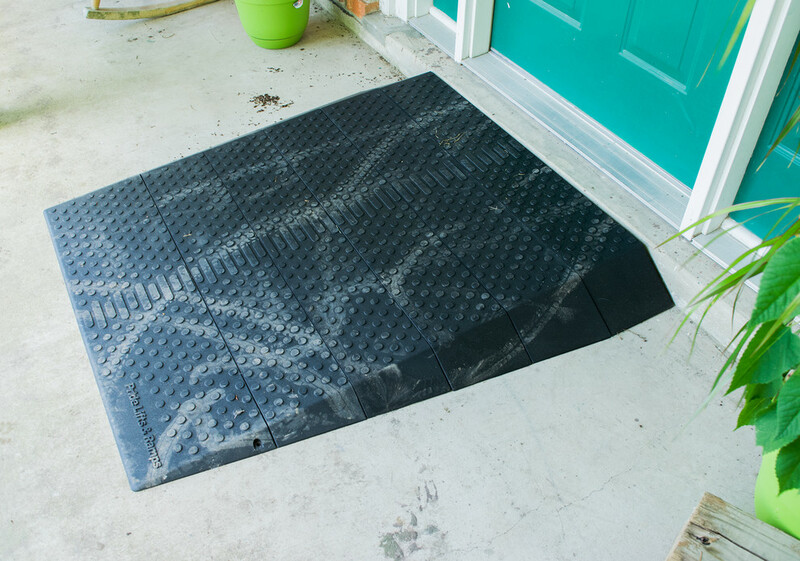 Rubber threshold ramp made to ease wheelchair access through door way. A small aluminum ramp and a rubber door ramp to ease wheel chair access through the entryway.